"Some people say since we have more money we are out of the woods. Not true." Thus, the governor of California pitched his revised budget plan before reporters Monday morning at the state capitol. It is a little better than the last budget presentation. But not much. 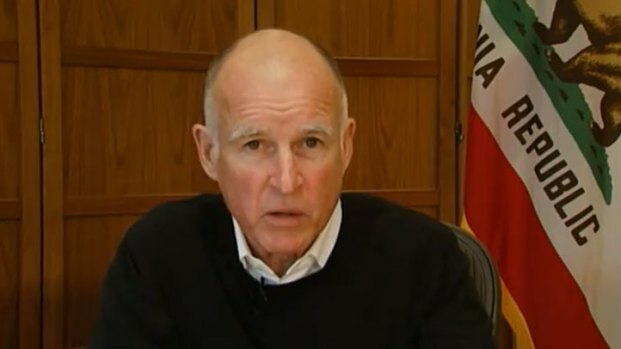 Jerry Brown acknowledged that the economy has grown enough that the state will receive an additional $6.6 billion in tax revenue that was not anticipated earlier this year. This will mean more money for education but there will still be an estimated $9 billion in deficits. While he has suggested the legislature forget about extending income tax hikes for now, he still says the state needs to extend hikes in the vehicle license fees and sales tax. From the start of the campaign for governor, he has said that would first require a vote of the people. Now he wants the legislature to extend the tax hikes with a public vote to "ratify" them "as soon as possible." Governor Brown's revised budget cuts jobs, parks and commissions. But he says he still needs some extended tax hikes, which are very unpopular with Republicans. The governor says he would also approve of a "spending cap" measure on the ballot as well to insure to voters that the government would do a better job in the future of living within its means. The governor is still hoping he can pick off two GOP legislators in the Assembly and the State Senate to pass the tax hike extensions. That may happen. Part of the concern from some GOP members is the backlash from constituents over the closing of state parks, hikes in college tuition, cuts in local services and larger K-12 classrooms. Another concern is the 2012 election. Two reform measures will kick in next year and they might prove to be a disaster for Republicans. While district borders will be redrawn, there is a possibility Democrats will be able to maintain their seats (by smaller vote margins). Republican officeholders may end up with more liberal constituents and more difficult re-elections. If the Dems can pick up just a few legislative seats they could have a two thirds majority in both houses of the legislature for the first time in state history. Republicans have argued that the increase in tax revenue is proof tax hike extensions are no longer needed. That argument still will not carry the day for the majority party in Sacramento or their union allies. Negotiations will continue until the budget deadline of June 15. One incentive for a compromise may be the potential for an election disaster in 2012. There is also the issue that, thanks to a vote of the public, this year lawmakers will not collect their pay if the spending plan is late.